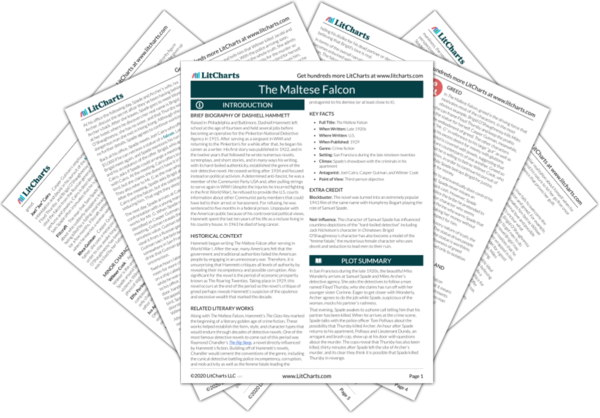 Instant downloads of all 942 LitChart PDFs (including The Maltese Falcon). 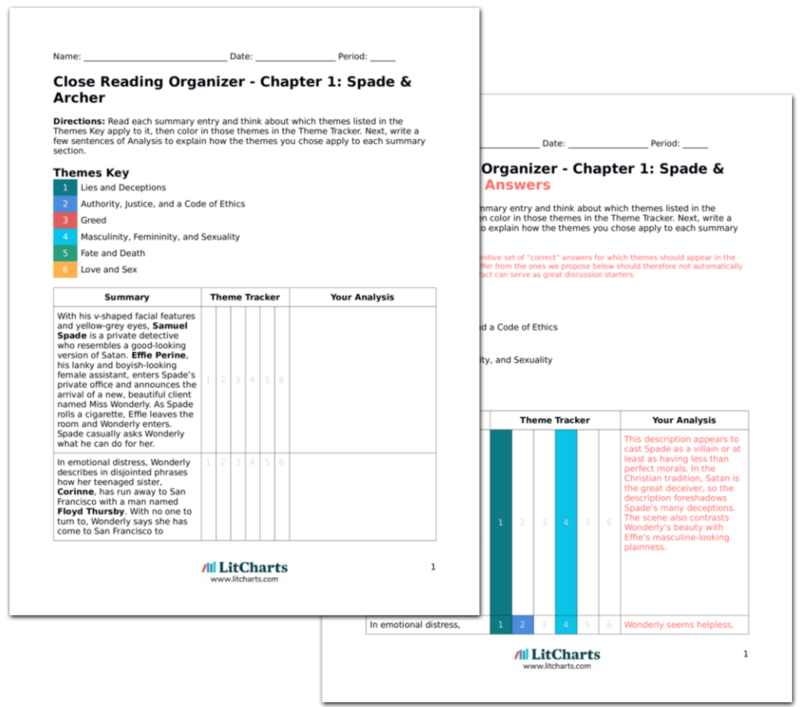 LitCharts assigns a color and icon to each theme in The Maltese Falcon, which you can use to track the themes throughout the work. Spade hides the falcon in a locker at the bus depot then takes the locker key and mails it express to his apartment. With the falcon safe, Spade heads to Gutman’s hotel room where a beautiful young woman, Rhea Gutman, lets him in. As soon as she does, she faints into his arm. In another example of Spade’s possible greed and emotional detachment, he prioritizes securing the falcon over immediately finding Brigid. And then he is immediately faced with another beautiful damsel in distress. Spade helps her walk back inside the apartment, realizing that Gutman must have drugged her. In his arms, Rhea reveals that she’s been keeping herself awake by making cuts in her belly with a metal pin. In garbled half-phrases, she manages to say that Gutman, Cairo, and Wilmer have taken Brigid to an address in Burlingame, a town twenty miles from San Francisco, with plans to kill her. Spade leads Rhea to the bed, calls the hotel manger to come look after her, and then calls himself a taxi to take him to Brigid’s location. Rhea is one of the big mysteries in the novel. She never appears again and we do not know if she is knowingly tricking Spade at her father’s request or if her father tricked her, too, by giving her this false information. As such, cutting herself is either an act of heroism in trying to save Brigid or of cunning deceit. The address turns out to be a house in the suburbs with a for-sale sign stuck in the yard. On the sign, there is a notice that prospective buyers can get the key from the people at a house down the street. After getting the key and searching the house, Spade realizes he’s been tricked since no one has been to the house in weeks. This house in the suburbs perhaps represents the idealized suburban life. But for Spade, who cannot maintain a relationship of trust with women, this house will always remain an unrealizable fantasy. For him, the house will always be empty. Spade returns home and, as he puts his key into the door, Brigid rushes towards him, embraces him, and explains she’s been hiding in wait until he came home. When they enter his apartment, the light suddenly turns on and Gutman along with Wilmer and Cairo, each holding guns, are waiting for them. In what looks like it will be the climax of the novel, all the major characters appear in the same room. Now, perhaps, all the deceptions and lies will be revealed. 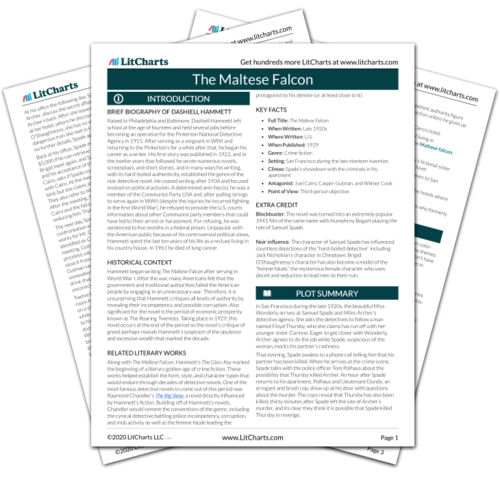 Get the entire The Maltese Falcon LitChart as a printable PDF. Plaue, Ethan. "The Maltese Falcon Chapter 17: Saturday Night." LitCharts. LitCharts LLC, 17 Jun 2015. Web. 19 Apr 2019. Plaue, Ethan. "The Maltese Falcon Chapter 17: Saturday Night." LitCharts LLC, June 17, 2015. Retrieved April 19, 2019. https://www.litcharts.com/lit/the-maltese-falcon/chapter-17-saturday-night.